The East Bay Bike Path is rather wonderful. It’s never very far from the water; perhaps its name gives that away, and it is in Rhode Island. 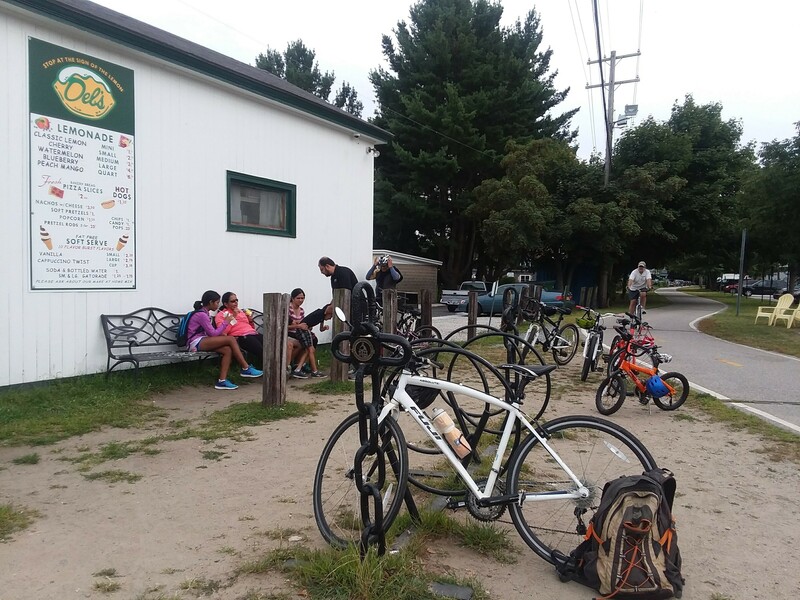 It was a lovely morning to cycle up the path from Barrington to its northern terminus in Providence. A breakfast wrap and coffee at Amy’s Place fortified me for the ride back. It’s about 10 miles in each direction. The second cycling thing of the day is not so positive. This afternoon, I tried out the Komoot app on my Android phone. Komoot allows you to plan your ride, provides navigation along the way, and… Well, I asked it to help me go to a particular bike shop right on the East Bay Bike Path. Komoot seemed unaware of the bike path. It wanted me to turn onto a main (by Barrington standards) road. I ignored it, crossed that road, and got onto the path, heading toward the shop. Komoot advised me to U-turn, presumably because it thought I should be heading back to the road. So I deleted Komoot from my phone as soon as I got home. Perhaps that’s harsh after one ride, but for me, bike ride planning and navigation needs to include bike paths, and especially the East Bay. I bought a mirror (this one by Mirrcycle, to be specific). They fitted it for me right away, then we discussed bikes and related matters for a few minutes. I’m happy to have Your Bike Shop as my local bike shop. So it was a good cycling day. Two out of three ain’t bad, as the song goes. Greetings from the Ocean State! To be more specific, hello from Barrington, a town of about 16,000 people, south of Providence. I used Google My Maps to show some of our early favorite places. Here’s a link to the interactive map, and here’s a link to a PDF of My Barrington. The kids might disagree with my including their schools among the favorites. I hope that they like the schools, since the school system is one of the things that brought us to Barrington in particular when we decided to move to Rhode Island. Anyway, school starts on Monday (August 28). We’ve been here about a week and a half. So far, so very good. More about Rhode Island, and about much else, soon. Thanks for reading! Author andrewPosted on August 27, 2017 Categories ChangingWay, Fun, ProvidenceTags barrington, map, mymaps, rhodeislandLeave a comment on Hello (from) Rhode Island! Washington, Ron Chernow’s biography of America’s first president, is tremendous. I’m just over halfway through it. I’ve just finished the third and longest of its six parts: The General. Part Four is The Statesman: hence the title of this post. Chernow deftly sums up a couple of striking things about Washington the General. He was that rare general who was great between battles and not just during them. Indeed, maintaining the Continental Army, given the lack of resources, the differences among the thirteen colonies, and other obstacles is as impressive as any specific victory. I’m looking forward to the last three parts: The Statesman! The President!! The Legend!!! Those are Chernow’s titles, but my punctuation. There’s a great cast of characters: not only Washington himself, but also Martha, Lafayette, and of course Hamilton. That said, I may spend some time with shorter and more fictional reading before I read the next 360-ish pages. Toward the end of the eighteenth century, a rebellion arose in America. It was provoked by the imposition of a tax on a beverage. George Washington was the most important single individual involved. Washington put down the rebellion with a show of armed force. It was 1794, so he was President Washington at the time. I wasn’t aware of the whiskey rebellion until today. We spent an interesting day at Mount Vernon. One of our party wanted to go down onto the sand near the wharf. That was not permitted. I had to break the news that we do not have freedom of beach. Today, March 8, is International Women’s Day. 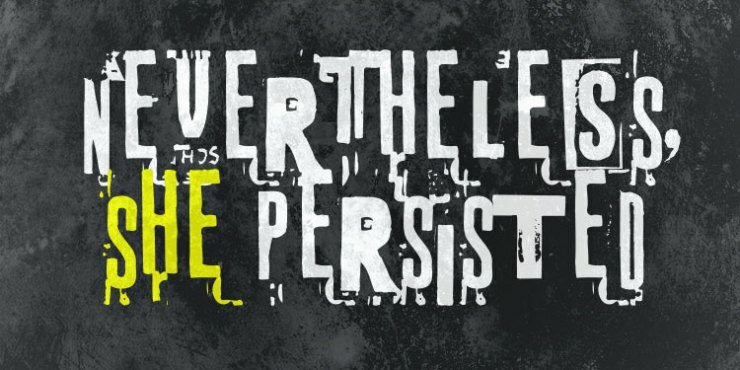 Tor is marking the day with a festival of flash fiction, in the form of stories inspired by the phrase “Nevertheless, she persisted”. I’m about to read the contribution of Catherynne M. Valente: The Ordinary Woman and the Unquiet Emperor. I’m looking forward to the other contributions. I hope that the day goes well for you. The world currently consists of about two hundred countries: sovereign states, most of which are members of the United Nations (UN). They tend to be durable entities with rather stable borders. Europe In Autumn (The Fractured Europe Sequence Book 1) , by David Hutchinson, which I’ll refer to as EiA. Too Like the Lightning: A Novel (Terra Ignota) , by Ada Palmer, which I’ll refer to as TLtL.